Charles (New York, United States) on 15 March 2009 in Miscellaneous. Any suggestions are appreciated. I won't give you ours because they were a little crass! 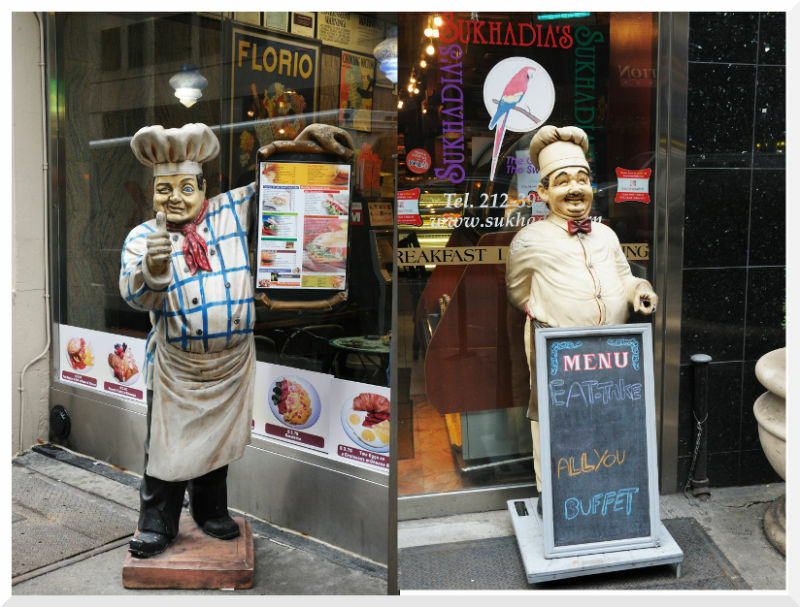 These two guys are about two blocks apart on 45th street. Mmmm I don't think my suggestions would be very PC at all lol! I cna't think of anything but your title made me laugh. Great shots are you trying to rival Ronnie two sense? These are wild. I like the guy on the left. A title eludes me. sorry, no proposition :o) but I do appreciate your humour and this funny shot ! nice sunday Charles ! Different but both are a little bit strong. To much food ? Eat here and be portly! two jolly rounded chefs, big and happy ! -- POP IN TO POP OUT !!!! !